Why is My Kid So Picky? If you are not already a fan of beets, I hope you’ll at least take a moment to learn about them and see if something peaks your interest. My husband was NOT a fan but now he eats them regularly. Beets are a root vegetable that have been around for ages. Most beets that we see on our grocery shelves are genetically modified, so you should look for organic as often as possible. Beets and their greens should always be washed thoroughly; they are often dirty and the last thing you want is a sandy or dirty bite! When you get home from the store, you should cut the greens off at the base and either prepare immediately or set aside for preparation within a day. They tend to wilt easily. The beet roots will keep in the fridge in your veggie drawer for at least a week if they were fresh when you bought them. There are several types of beets that are readily available in the United States: Red Beets, Chioggia Beets, and Golden Beets. Red Beets are the deeply reddish-purple colored beets that are familiar to most people. Chioggia Beets are a lighter shade of red on the outside and when sliced open, they resemble candy cane stripes. They are also known as candy cane beets for this reason. Golden Beets (pictured on the bottom in slices) are yellowish-orange on the outside and a beautiful yellow on the inside. As the shades of beets get lighter, the flavor gets milder; there is less earthiness to the taste and they are all sweet. Lots of people don’t realize that the beet greens are amazing! Not only are they extremely nutritious, they are also delicious too! They have a very mild beet flavor to them, but resemble spinach or swiss chard in taste and texture. When you buy beets by the bunch, always see if the greens are intact and can be used as well. The greens should be a deep rich color green. If you see yellowing or they seem floppy or wilted, try finding another bunch. FYI, the stems will usually match the type of beet you are buying (e.g. yellow/orange stems for golden beets, darker reddish for the red beets). Beets and their greens have incredible nutritional benefits. The actual beet is very low in calories, contains no cholesterol, and has tiny amounts of fat. They have fiber, vitamins (e.g. B-complex vitamins such as niacin B-3, pantothenic acid B-5, pyridoxine B-6, vitamin C, and potassium), minerals (e.g. iron, manganese, copper, and magnesium), and plant derived antioxidants. 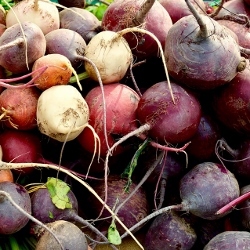 Raw beets are particularly high in folate, but the amounts decrease the longer you cook them. The greens have a lot more vitamin C in them and are loaded with carotenoids, flavonoid antioxidants, and vitamin A. Beets and their greens are rumored to: lower blood pressure, fight inflammation in the body, help detoxify the body, and ward off osteoporosis. Just a word of warning…if you have a history of oxalate kidney stones, or urinary stones, be aware that beet greens are very high in oxalates (oxalic acid) and you may want to avoid them. The beet root is a safer bet! Also, some people find that beets color their urine and stools, but this is harmless and is called Beeturia. If this happens to you, don’t panic…it will go away! Based on all of these nutrients, beets and their greens are extremely beneficial and can be a wonderful addition to your diet. So, how do you prepare your beets? You almost always have to peel them before doing anything else. 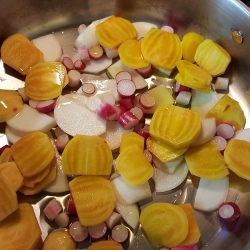 You can shred them raw for salads, chop them into cubes and steam them, make them into noodles for a lower carb noodle substitution, or make them into a soup such as Borscht or as a component in a vegetable soup. Some people love to pickle their beets and others like to roast them into sticks like ‘fries’. A very popular way to make them also involves roasting them whole in their skins in the oven (this is the only time I leave the skins on). When they are done, the skins peel off very easily and it reduces some of the mess. I love beets in every way described here, but my all-time favorite is definitely as a noodle. Growing up, my Great Aunt Fanny used to make the most amazing Borscht, so I always think of her when I make any kind of beet soup. Be aware that beets are so rich in color (one of the reasons they are loaded with good nutrients) that they can temporarily stain your cutting board and hands! If I am making red beets, I often wear gloves to prevent staining of the hands. The Chioggia and Golden beets only stain a little bit and it usually washes off fairly easily and quickly. Next time you’re at the grocery store, consider trying some beets. I will be posting some beet recipes in the coming week. Where have you been, Sari? Delicious recipes free of gluten, eggs, dairy, and soy!